This Barking Wednesday I would like to introduce Diesel. Diesel is our new puppy! He is a Smooth Fox Terrier born on December 30th, 2014. We will be bringing him home early March when he is 10 weeks old. Here is a two week old picture of him, his mom and his three siblings. Diesel is the far right puppy! He is White, Tan & Black ~ a little of all three colors. My hubby and I have always thought Smooth Fox Terriers were a fun breed. We like their personality, size and the look of the breed. 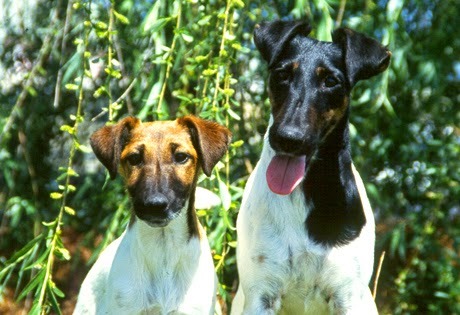 The Smooth Fox Terrier has a sleek, easy to maintain coat. Its sturdiness and size combined with its friendly and playful nature make it an excellent companion for children. They are bold but not aggressive towards people. Fox Terriers make excellent watch dogs in the home. New owners should be aware that the breed's innate sense to dig may affect the family yard or flower beds unless the dog is taught otherwise. Should not exceed 15½ inches tall at the shoulder and 18 pounds. I love this pic I found on AKC.org! The next few Barking Wednesdays will be all about us getting ready for a new puppy. Then I will be posting Puppy info...our life with a new puppy! Helpful hints on What to Do and of course some tips on What Not to Do! Please comment with any Puppy Advice you have! Aww, I love him! He is a nice looking dog and I am sure you will enjoy him! I don't have any puppy advice but what a cute puppy. I am sure you will love him to pieces. I don't either because our dog is a rescue, so we got him when he was 2, but I am sure you will figure it all out. OMG! Diesel! He's so cute! Consistency is key with puppies. That's the main thing to remember. Whatever you want to teach them, do it every time. What a sweet little puppy! Congrats on the new addition! we just got a kitten to complete our 2 dog family. She's keeping everyone on our toes as I'm sure Diesel will too. How nice! I remember my dog as a puppy too.. cutest thing in the world. <3 Congrats on the new family member! How cool, I bet you can't wait for him to come home. I can't have dogs due to my allergies so I don't have any advice. Congrats on welcoming a new puppy into your family. It's such a busy and sweet time when you have a new puppy. Congrats on your new puppy. If you haven't already, get a crate for potty training! It will make it so much smoother! awww Congrats! He is adorable! What beautiful dogs these are! Lots and lotso f patience. It's like having babies! Awww little Diesel is a cutie! This breed sounds awesome! I hope he doesn't dig up too many of your plants! Fox terriers are really cute. Congrats on the new family member! Congrats on the new addition to the family! I love him already! What a cute furbaby. Aww that makes me want another little puppy... Congrats on your new addition! Our dogs had pups back in October 2012... It was amazing! Patience and lots of love is all the advice I have. Congrats on your new little one! What a cutie! My neighbors just had a litter of puppies, and my kids have been giving me all kinds of puppy dog eyes hoping I'll agree to letting them bring one home. Awe congrats on your new fur baby. I love his name. Puppy! I want one so bad. I can't wait to move. I told Hubs one day he's just gonna come home and there's gonna be a dog. What a cute puppy! 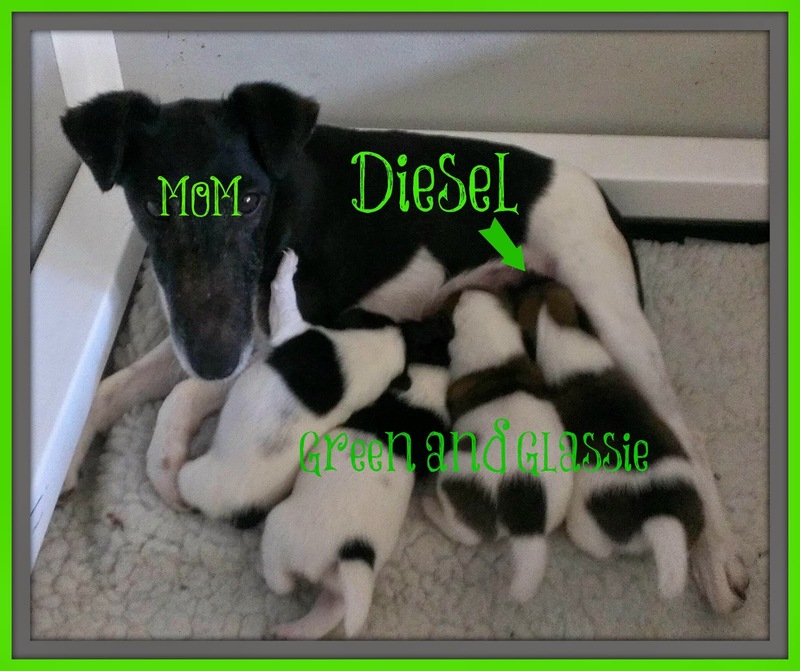 Congrats to you for welcoming Diesel to your family! What cute puppies! Sometimes I miss having a dog, but shhh don't tell my cat. I am excited for you. Can't wait to hear more of this little cutie. I have never seen this breed. They are super cute! I've never had a dog in all my life! My mom trained show dogs and she was very good at it. I do not have dogs, so I would have no advice to offer but the pup is cute. Oh my goodness! what a cutie! A pet does so much for a family. What a cutie he is. I love the name you gave him too. How exciting. I remember when we got our Shih-Tzu almost 3 years ago for my toddler. He was born just 2 weeks after she was and we got him when he was around 6 weeks old. He's been a family member since then. Can't imagine life without him. Can't wait to hear more about Diesel. Diesel is an adorable puppy! Like all babies, there's lots of advice. Love and gentle discipline are two things to follow. He may cry when he moves away from his family, so have something small and cuddly for him to snuggle up to. Have fun! Congratulations on the new addition to your family. What a cutie pie! So cute! Congrats to your new addition. Our pup Bailey is now 10 and she still acts as if she's a puppy! Welcome to your new family member. What an adorable doggie! Oh the cuteness. I love puppies. Congrats on you new family member. Super cute! It has been a long time since we've had a puppy around. The best advice is to have lots of love to share. Oh, so cute!! Sorry I don't have any puppy advice. We have always gotten our dogs a few years old since they are rescues. SO cute!! Have fun!!! We are not a dog family so I do nto have any advice. lol good luck! Oh my goodness! What darling little fur babies! He is so cute! I love the name Diesel too! He's gonna be a lot of fun! So beautiful! We love dogs, in our house we have 7! !